In many science fiction shows of the past, technology is shown as all happening on different types of physical media like chips. But someone should give those shows a memo, because the future of information is looking like it’s going to be all on the cloud. Already, users from a diverse number of fields are making use of cloud computing for purposes of easy transfer of information and backup. 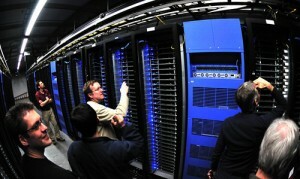 But this is probably only the beginning of what cloud computing can do. This stands for “Bring your own device,” and it’s an increasingly common practice in business. In the old days, you came into work and they gave you a computing device to use. This was to protect information that was proprietary from being leaked by employees, or from other security risks. But with the advent of cloud computing, companies can now authorize employees to use their own devices, and simply connect into the cloud when they need to use any company information. This allows companies to keep track of what employees use and download without having to require they use certain devices. Saves Costs: By letting employees use their own devices to connect to the cloud, this means that companies don’t have to purchase the devices themselves. Helps with Morale: Though it might seem counter-intuitive, a lot of employees will like the idea of bringing their own device. It gives a kind of control and customization that helps personalize the workplace. Added Security- Oddly enough, in many cases using the cloud for information is more secure than making people use a proprietary device. This is because companies can monitor exactly how people are using the information, no matter where they are. Cloud computing is likely to move towards the ability for individuals to access a large amount of information from a small mobile device. Computing is turning into something you do on the go. It’s becoming unhinged from a particular spatial location. An example of this principle is Motocast. This service lets you use a mobile smart-phone to access any drive from any computer you want no matter where it is. The mobile device becomes simply a terminal for access the files, instead of containing the files themselves. As devices get smaller and smaller, there will be a larger and larger need to rely on cloud technologies to retrieve files instead of having to store them in bulky hard drives. These files can be anything from Word documents to streaming video. As technology progresses and becomes continually smaller and more complex, many possibilities for the future of cloud computing have been proposed, including in the fields of biotechnology and automation. After all, a cloud model based on something like Wi-Fi would be an excellent way for nanobots in your body to communicate with each other and keep you healthy. Or alternatively, a technology that is much less speculative, is that of automatic cars. The Google car has already demonstrated the power of cloud tech like Google Maps and how it can be made to allow cars to drive themselves. Certainly, technologies similar to these are likely to proliferate in the near future. This is a guest post by contributing author Linda Michelle for Weclapp cloud software. Linda usually covers tech, business and lifestyle and also ejoys the benefits of cloud computing applications in her everyday freelance work.